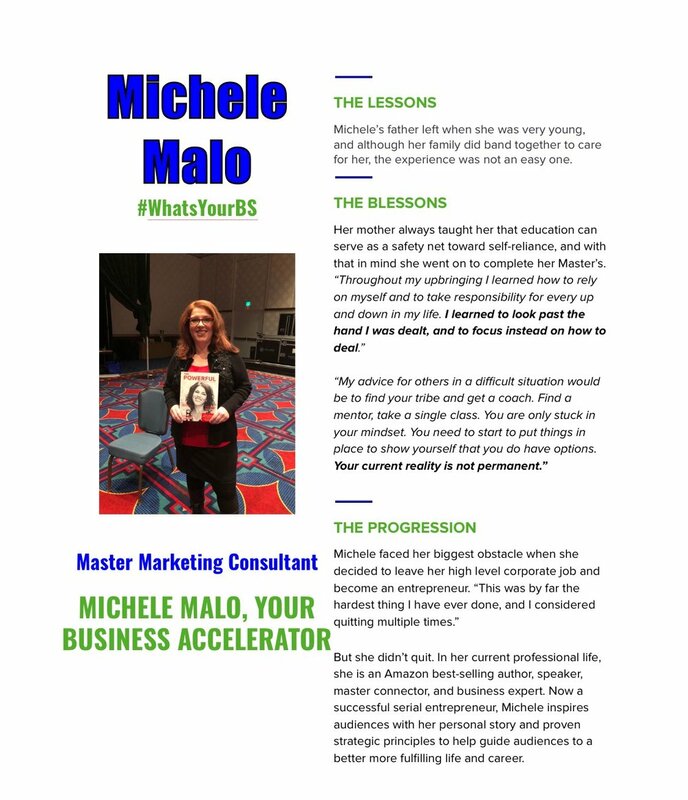 My name is Michele Malo, I was brought up on the Northwest side of Chicago as an only child. My dad left when I was about 4 years old, so my mom went back to work and my great grandmother moved to the neighborhood to watch me before and after school. My dad would take me every other weekend, and my mom’s parents were like my second set of parents whenever we needed them. My family really did try to shelter me throughout this time, however, being a product of divorce at an early age is not easy on any child. Throughout my upbringing I learned how to rely on myself and to take responsibility for every up and down in my life. I learned to look past the hand I was dealt, and to focus instead on how to deal. I am a proud product of the Chicago Public School system where I graduated from Lane Tech HS. My mother always taught me that education can serve as a safety net toward self-reliance, and with that in mind I went on to DePaul and then the University of Nebraska–Lincoln, completing a Bachelor’s degree in Advertising with minors in Marketing, Communications, and History. Finishing my Master’s Degree took a bit longer than anticipated. As I climbed the corporate ladder, I began to struggle with balancing work, education, and life. Oftentimes the educational workload would suffer as a result. However, I’ve found that the way to forge ahead is through focus and friends. I try to keep my focus on the things that will make my situation better, and surround myself with people who want the same for me and for themselves. One of the biggest obstacles I’ve faced was the decision to leave my high level corporate job and become an entrepreneur. This is by far the hardest thing that I have ever done, and I have considered quitting multiple times. However, I have learned that my network is my net worth, and my relationship capital is at an all time high. They will not allow me to fail, so I cannot and will not give up. In my current professional life, I am an Amazon best-selling author, speaker, and business expert. A key to my success is carrying myself with confidence, and understanding the best way to communicate with others. There is a boy’s club if you allow it, but I prefer to just bust open the door. It’s all about listening and providing solutions anyone can relate to in order to achieve their goals. I call this business situational awareness and it applies to all. My biggest goal currently is to expand my Hospitality Consulting business, along with advocating and coaching small business entrepreneurs. I am a strategist, and I believe that all businesses can monetize if they act with focus and with an eye on speed to implementation. I don’t believe giving back to your community has to wait until your goals are accomplished. I believe all your focus and determination works better when you put your education around experience to work for your career or business, your friends and family, and your community. All these goals can coexist as long as the have a strategy, are realistic, and have a deadline. My advice for others in a difficult situation would be to find your tribe and get a coach. Find a mentor, take a single class. You are only stuck in your mindset. You need to start to put things in place to show yourself that you do have options. Your current reality is not permanent. When I decided to invest in myself through a coach, that’s when everything changed for me. I invested in a coaching program that had individuals like me, with similar values and goals. They were just a bit further down the path than me, which was helpful because I could see that path and learn to trust the road signs. Plus you have someone there to give you what you need to hear rather than what you want to hear. This was when I made true transformations.